I know most of you have been following Igboist kitchen contest through this blog, and for those that are asking how they can partake in the contest, well, its still not yet open to everyone as its still basically an online affair. This addition of Igboist kitchen was PROUDLY SPONSORED BY Mercy Cindy Kalu. and organized by Mmasinachi Jenny Emoka‎. DISH: ONUGBU SOUP. and as usually i will be sharing their Ingredients and process of Preparations. Start by steaming the beef, chicken and stock fish with knorr cube and salt boil till tender. while the meats are boiling, boil the cocoyam with the skin on. boil till tender, this should take roughly 20 minutes on medium heat. When they’re soft, peel the skin off,chop them into small chunks in your electric blender, add little water and blend. If you don’t have blender, pound till smooth in a mortar then set aside. Wash the bitter leaves with hot water to get rid of as much bitterness as you can. There should be almost no hint of bitterness left in the leaves after washing. When the meats are all soft, add the dried fish, crayfish and ground pepper stir and combine. Add the palm oil leave to thoroughly combine for 3- 4 minutes. Add the blended cocoyam into the stock in small dollops. The cocoyam will dissolve and combine for 2-3 minutes. Then add the ogiri, stir and combine. Then add the washed bitter leaves to cook for 2-3 minutes. Do not over cook your vegetable. And it’s done. Serve with your preferred swallow. 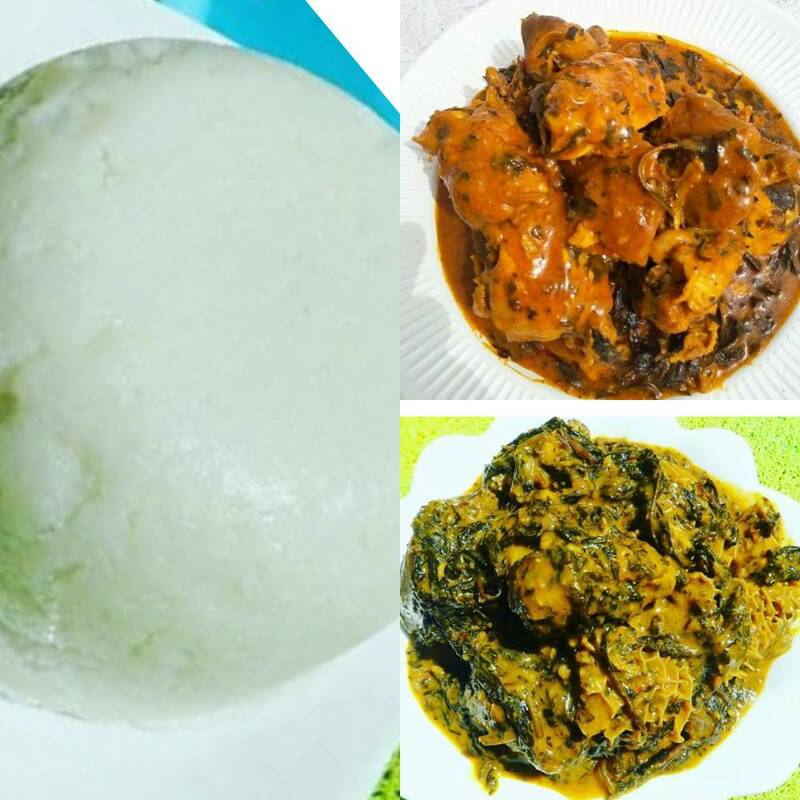 Wash your bitter leaf and set aside, cook and pound the ede and set aside, cook and sieve the palm fruit and set aside, thoroughly wash your meats, fish and stock fish, then steam together and set aside, wash…salt and roast the fish (optional), pound the pepper, crayfish and ogiri igbo together and set aside. Well, You have seen it. Who do you think deserve to be our chief chef among these two great chefs? Share your opinion via the comment box below. I’m regretting reading this on an empty stomach. Both look delicious but my favorite is Constance’s dish. I’m not so sure how cow intestines taste. However I would definitely try both of these as I always like to try new things. These all sound so exotic and ‘out there’ for me that I’m not sure I’d be able to tell at all who won without tasting it. Seems like such rich and decadent comfort food… I’d gladly be the guinea pig! I have not tried Nigerian dishes yet but I am interested to try. Learning of a new culture is always best done by sampling their food! Well this looks Devine! Get in my belly. Huge fan of Asian food. It looks like a great mix of flavours, not sure if I would like it or not but would give it a try! I would have to say the second chef just based on the looks, only taste could define them better! Asian food is amazing! My husband and I love going to asisan resturants. I’ve tried cooking asian but it always turns out wrong LOL!! I do like the look of these dishes, woul definitely try! I really like what you created. It is not something I have tried before or even considered, but like one of the commenters above mentioned, I really love watching cooking shows and watching people create. I’m gearing towards the Chisom Cherry. I haven’t tried any of these dishes but they both look lovely and seem to go great with rice. Oh these all sound amazing and they look delicious too! I love how much flavour jumps off the page! I have never had dishes like this before, they look very interesting, particularly the dried fish, which I imagine would be really tasty when steamed. I might have to do a cooking challenge with some of my friends, seems like it would be fun! This looks like a fun and tasty competition. I’m going with Cassandra’s dish based on the end result. The color draws me in and the sauce looks good. I’m a fan of food full of various flavors. The food looks tasty packed with flavors. I would love to taste them, especially the first one ONUGBU SOUP. Cooking shows are always fun to watch! I am so addicted to all the Gordon Ramsay challenges. I will go with Constance’s soup.Her choice of meat and fish is thoughtful and great for the soup. She sure prepared it like those our grandmamas in the villa their soups are forever incomparable with any other and we say they have magic fingers. For the record, I will eat the two soups.That is how much I love onugbu soup.